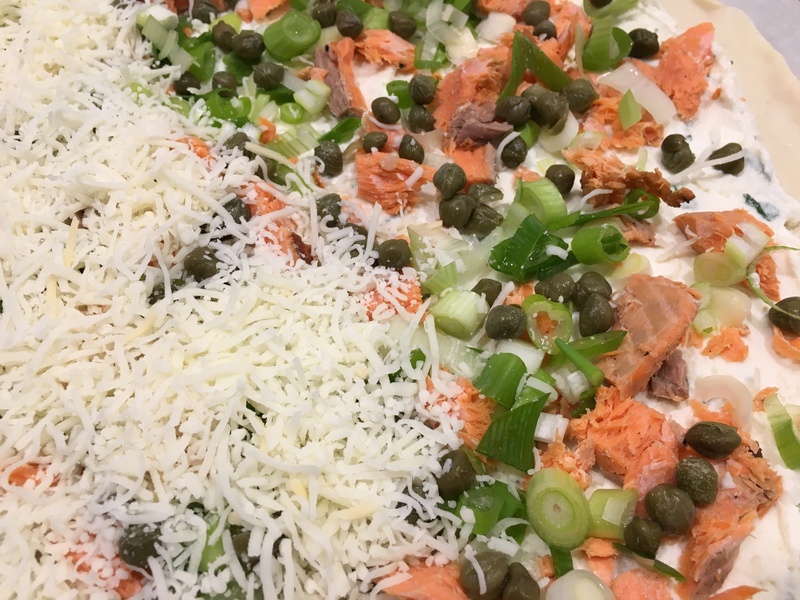 White Pizza with Grilled Salmon and Capers, Green Onions and Parsley, YES! Anytime I can have a pizza with no tomatoes, I jump on it. So, rather than rely on others to supply me with my fix, I developed my own white sauce. Not only does it taste delicious, you can put it together in seconds, and it freezes! Since I use WEWALKA doughs, I freeze in 1 cup containers for the Bistro Style dough and 2 cup containers for Family Style dough. And, think out of the box.. add different fresh herbs to the sauce…trade out the parsley for basil or dill or tarragon…..Change up your flavor profile. White Sauce for Pizzas is one of MJ’S MUST HAVES in her ‘freezer pantry’. 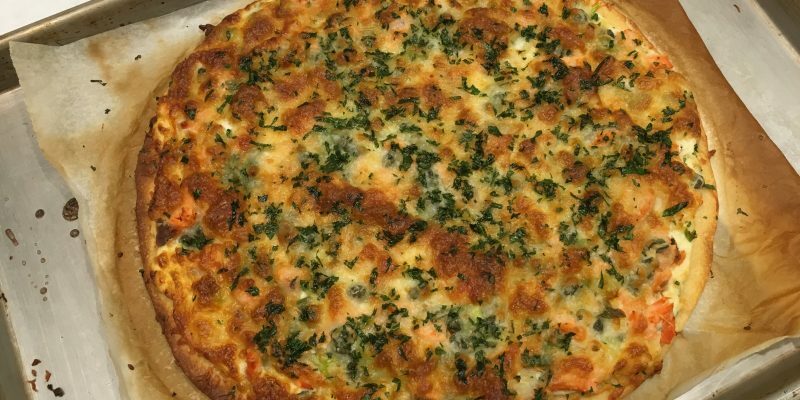 I always do an extra piece of salmon when grilling for another meal…pop it in a ziploc and have it in the freezer for a pizza night. But you could also buy it in the prepared food section of your grocery store. Or, you could substitute a quality brand of canned tuna. Why not? BTW, the whole pizza freezes beautifully. I divide it into fourths, and wrap in plastic wrap. Stack’em up in the freezer to pull out when you need it….last minute dinner or an appetizer for friends over a glass of wine. Stir together all ingredients. 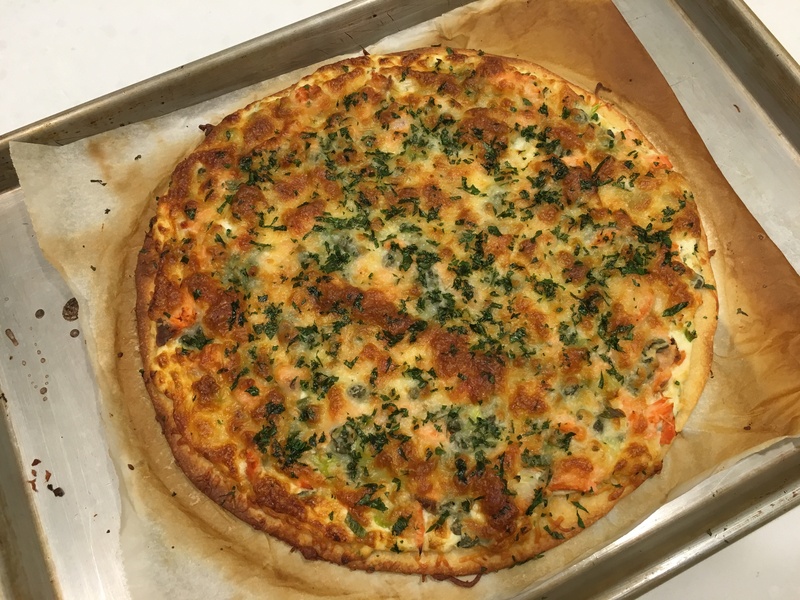 Use one cup of White Sauce for Pizza for one WEWALKA Bistro Style Pizza. Unroll pizza dough with the parchment and place on baking pan. Spread white sauce evenly over dough to within 1/2-inch of the edge. Pull salmon filet into small pieces and scatter on top then evenly sprinkle capers and green onions, finishing with parsley. Top with shredded cheese and parsley garnish. Bake in preheated 425 oven for 15-20 minutes or until cheese and crust are lightly browned.